Later that month, the King was unhorsed in a tournament and knocked unconscious for two hours, a worrying incident that Anne believed led to her miscarriage five days later. On the day that Catherine of Aragon was buried at Peterborough Abbey, Anne miscarried a baby which, according to the imperial ambassador Chapuys, she had borne for about three and a half months, and which "seemed to be a male child". For Chapuys, this personal loss was the beginning of the end of the royal marriage. Given Henry's desperate desire for a son, the sequence of Anne's pregnancies has attracted much interest. Author Mike Ashley speculated that Anne had two stillborn children after Elizabeth's birth and before the birth of the male child she miscarried in 1536. Most sources attest only to the birth of Elizabeth in September 1533, a possible miscarriage in the summer of 1534, and the miscarriage of a male child, of almost four months gestation, in January 1536. Anne now knew that it was imperative that she produce a son. By January of 1534, she was pregnant again, but the child was either miscarried or stillborn. In 1535, she was become pregnant again but miscarried by the end of January. The child was reported to have been a boy. The Queen was quite upset, and blamed the miscarriage on her state of mind after hearing that Henry had taken a fall in jousting. She had to have known at this point that her failure to produce a living male heir was a threat to her own life, especially since the King's fancy for one of her ladies-in-waiting, Jane Seymour, began to grow. The relationship between Anne Boleyn and King Henry VIII quickly deteriorated. His passionate love for her was turning to hate. 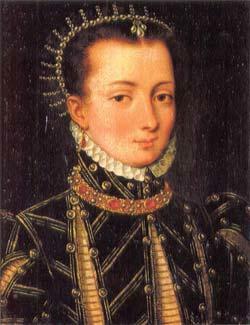 But Anne once again became pregnant in 1534. The pregnancy was short-lived - Anne miscarried a baby boy. The miscarriage was believed to have been prompted by the shock from the news that the King had met with a terrible accident - it was not clear whether he was alive or dead. He had in fact badly injured his leg when he fell from his horse when jousting. The miscarriage was a terrible blow to Anne Boleyn. The King blamed Anne Boleyn, he began to believe that his second marriage was also cursed. In 1535 became pregnant again but this time she miscarried the baby. This tragedy sealed the fate of Anne Boleyn.